It’s the fluttery leaves in the magical breeze in the summery sun outside. Outside takes you on a tour of a garden seen with the imaginative eyes of two children. Feel the magical breeze, the tickling grass and the warmth of the summery sun, see the fluttery leaves and hear the chime bells up high as you explore. 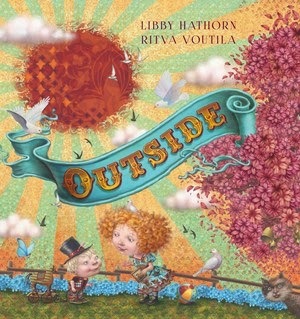 Author Libby Hathorn takes readers on a wonderful sensory journey through the garden with the children. There is a real feeling of warmth and fun and happiness about the story, with the two children filled with a sense of shared wonder and excitement about their adventures outside. I love that the mother ventures out into the garden for a little while as well, sharing a story with the children and bringing them a snack. There is such a lovely sense of family and the pleasure that can be found in sharing little things. Ritva Voutila’s digital illustrations are vibrant and whimsical, with gorgeous colours and patterns turning this outside space into a wonderfully magical place. Outside is a gorgeous celebration of childhood wonder and imagination and the special way children respond to the outdoors.